We’d love your help. Let us know what’s wrong with this preview of Of Scars and Stardust by Andrea Hannah. But the memories of that night still haunt her in the city, and as hard as she tries to forget what her psychiatrist ca After her little sister mysteriously vanishes, seventeen-year-old Claire Graham has a choice to make: stay snug in her little corner of Manhattan with her dropout boyfriend, or go back to Ohio to face the hometown tragedy she's been dying to leave behind. To ask other readers questions about Of Scars and Stardust, please sign up. I was lucky enough to read an early version of this story and as I told Andrea at the time, this book kept me up at night. I didn't want to sleep. I wanted only to wrap myself in the anxiety and tension and beautiful words that Andrea put together in this wonderful story. I do know Andrea personally, but I assure you, this book is one that I will personally buy MULTIPLE copies of to give as gifts to friends who love gorgeous, poetic prose mixed with pacing that doesn't quit and imagery that made I was lucky enough to read an early version of this story and as I told Andrea at the time, this book kept me up at night. I didn't want to sleep. I wanted only to wrap myself in the anxiety and tension and beautiful words that Andrea put together in this wonderful story. I do know Andrea personally, but I assure you, this book is one that I will personally buy MULTIPLE copies of to give as gifts to friends who love gorgeous, poetic prose mixed with pacing that doesn't quit and imagery that made me question my own perception of what real fear is made of. There are some books that are just so gorgeously bizarre, that you become lost in a world of fantasy and madness. And then there are books like this: which try to achieve that and just leave you feeling confused and disappointed instead. It's not often I ask 'what's this book about?' after I've read it, but I finished Of Scars and Stardust feeling like I wasn't sure what I'd read. Was it about mental illness, or was it actually a paranormal book with wolves? Was it both? I don't even know any more. Ever since her sister's brutal attack, Claire has been living with her aunt in Manhattan, haunted by the memories of that night and fearing her home town's legendary wolves are stalking her. When she hears her sister has disappeared, she fears the wolves have taken her and decides to face the past and go home. Claire returns to a town where nobody believes in wolves, but everyone believes how crazy she is. Most of this novel is Claire struggling to convince people wolves are real, while struggling to believe anything is real herself. And it's just confusing as hell. Factor in Grant, her old crush who is now – conveniently – a police officer, who wants to help Claire find out the truth, and I was left following two mundane characters on an investigation that revolved around a lot of dead-ends and frustratingly frequent red herrings. The ending could've won it back, if it made sense of everything that happened, but it didn't even attempt to. Instead, Ella's disappearance was waved away by having her her story briefly mentioned in an epilogue, and every other loose end was left to hang, untied. There were some interesting parts, but this book tried to be so many things, and the problem was that it tried to be all of them at once. Which meant the end result was a story with no real identity, that flitted between confusing and bland. Favourite quote: "Sometimes, the unknown is far scarier than what's really there." I am so utterly confused and mindblown. I don't think I've ever felt as I did after completing this book. Wow. The same word keeps repeating itself over and over again in my head--HOW?! "Because everything I had ever let myself love withered here, in this cornfield, under the weight of the stars and the sky and the wolf's snapping, yellowed teeth." I feel like Hazel from The Fault in Our Stars after she completed her favorite book and had so many unanswered questions t 5 stars. I feel like Hazel from The Fault in Our Stars after she completed her favorite book and had so many unanswered questions that she contacted the author so she could be satisfied with the ending and find closure from the book. To be honest, I did have a couple of minutes in which I considered doing the same (contacting the author and bombarding her with questions, that is). I just couldn't understand how the ending to this book could be possible and it literally made me re-think the entire book. My thoughts are all over the place, but I'll try to organize them as best as I can to communicate my thoughts and feelings from this entire book. Let's start at the beginning. From the beginning I was enjoying this book. It had a creepy/intriguing feel to it that instantly captured my attention, and you can easily tell it's a dark book. I had NO idea as to what direction the story would take at any point in the book, which only amplified the intrigue I was feeling. If I had to describe it in comparison to other books, I'd say it's like a Laurie Halse Anderson book combined with a tiny sliver of Shiver by Maggie Stiefvater elements. At least, those are the two that came to mind as I read the book. Nothing I say can truly describe it, because it's unlike anything I have ever read. You can also quickly tell that the book is well-written. There were great descriptions and an abundance of similes/metaphors/personifications in the book, but overall it was easy and quick to get through. It's strange because I wouldn't tag this book as fast-paced and yet I flew through it. It's not the type of book to keep you rushing through the pages to get to the next part (for the first half, at least) because it's all mainly just finding clues to a mystery and about a girl trying to piece together her life mystery-by-mystery. It's slower-paced, but it's never boring. There are a countless number of books that I find myself struggling to get through and constantly checking how much of the book I have left, but "Of Scars and Stardust" was no such book. It captivated me from beginning to end. There's also a romance involved, which I'll delve into later. This is a book that is best read when going into it knowing nothing. The less you know, the better. That way it can shock you all the more, for the book constantly confuses you until you get to the ending and then it just outright bewilders you (but for a very different reason). In my opinion, I feel as if this is a book you will either love or hate. There's no in-between. If you don't mind darker/twisted stories that will confuse the hell out of you, definitely read this book. I wouldn't classify it as outright terrifying since I'm the biggest scaredy-cat the world has ever known, but it does have a creepier feel to it. Just know that before diving into the book. I really liked the main protagonist, Claire. She got straight to the point and wasn't the type of protagonist that relied on others for help. She also wasn't the type to annoyingly keep everything to herself. She was a well-rounded character, and even though I couldn't particularly relate to her I liked her a lot and was never annoyed by her. Everything she felt made me want to feel the exact same way. The book wouldn't have worked if it were told from any other person's perspective. I also liked the love interest, Grant. I wasn't swooning or fawning over him, but I was still a pretty big fan of his. I loved that the book didn't focus on the romance but had it as a sort of sideshow; it made the book much more interesting and entertaining. It's always great when you feel like the couple is compatible instead of the author just telling you, and I found Grant and Claire to be a great match. I pretty much loved all of the other characters as well. All of them contributed to the story in some way, and I had an opinion about each one (whether good or bad). The main characters (Claire's parents, Rae, Ella) all had depth to them and were more than just "another character". And--at last--I'm going to briefly discuss the mystery and the ending. I don't want to say any more than I already have about the ending because I don't want anyone to expect anything from it, but I will say that the very beginning and the very ending of this book were my favorite parts of the book. The ending should evoke an emotion out of you, whether it be unsurprised confusion or outright shock (like me). It made me personally like the book much more than I already did because it messes with your head and leaves you wanting more. The middle of the story was great as well, but I'm simply highlighting the intro and outro to it because they were my favorite. Also, the big mystery in the book was well-developed and will keep you guessing throughout the entire book. Overall, this is an absolutely fantastic standalone. I felt strong emotions for the story as well as the characters, which doesn't occur often with standalones. Even 700-paged books can't evoke such a strong emotion from me that the ending to this book did. A plot well-developed, for sure. This book is either going to work or not work for you, so I can only hope those who read it love it as much as I did. MAJOR SPOILERS AHEAD. DO NOT READ THE REST OF THIS REVIEW IF YOU HAVE NOT FINISHED "Of Scars and Stardust". FINALLY. The spoiler discussion. I was trying not to rush the non-spoiler part of this review but I'll admit I'm glad we're finally here because I have so so much to say about the book. I'm going to jump right to it. The ENDING. I could pretty much describe how I felt with two words: WHAT?! HOW?! "And then I howled, louder than the wolves, louder than the rush of blood in my ears, louder than the street traffic in Manhattan. I stabbed, stabbed, stabbed until the air was sliced into ribbons around me, and the sun was poked full of holes and the whole world turned bloody." It's not that the thought that Claire was hallucinating didn't occur to me. It's in the synopsis, for crying out loud. But even though everyone tells her she's delusional and even she herself questions her sanity constantly throughout the book, I still wanted to believe her so so badly because we were seeing things from her perspective and we could SEE that she was innocent (or so we thought). When she found out that people thought she had hurt Ella, I remember rolling my eyes and brushing aside the thought. I believed the wolves were real more than I believed that. And now I feel like an idiot. I had to read the part with Grant (where they're about to run away and she hears the howls/sirens and sees the "wolves" attacking her and says the wolves teeth feel like handcuffs) about 10 times to fully understand. I was so conflicted and confused. How could she have attacked Ella and Grant when she remembers what she was doing at the time the attack must have happened? That's what was stumping me the most. She ran away with Patrick when the wolf attack happened at the party, but apparently there was no wolf attack (and perhaps not even a party) so how did she get to Patrick's house and retrieve Ella's journal? So was she really attacking Grant during the so-called party but was hallucinating the party instead of seeing that she was attacking him? Ahhh it's all so confusing. But really--how are we supposed to know what was real and what wasn't? It's driving me insane not to know. Was every moment with Grant real? Didn't Grant say he heard the howls at times as well? Was she hallucinating that? La mitad del libro me la pasé intentando meterme por completo a la historia, me costó trabajo y había momentos en los que quería dejarlo sin más. Pero al final decidí continuar porque el misterio y las ganas de saber qué ocurría realmente me carcomían. La historia es magnífica y definitivamente es el tipo de libros que me gustan, que juegan con tu mente y no sabes que es real y que no. Me gusta ese giro que la autora le da al casi final y siento que eso hizo que me gustara mucho más. (Tuve que lee La mitad del libro me la pasé intentando meterme por completo a la historia, me costó trabajo y había momentos en los que quería dejarlo sin más. Pero al final decidí continuar porque el misterio y las ganas de saber qué ocurría realmente me carcomían. Seriously, this was me for a good hour after I finished this book. Then I developed a theory about the book, but it is riddled with spoilers, so I will save that for the end. So, our main character is Claire. Claire has a sister named Ella, who she positively adores. Some stuff happens to Ella. Claire ends up in New York, where she ditches school on the regular to do drugs with her loser boyfriend. As per the synopsis (so I am not spoiling anything, you see), Claire goes back to her backwoods, messed up Ohio town of Amble. There is very little I can say about this book without the spoiler factor. I'll do my best. Also, if you haven't already read it, skip the synopsis in general. I think it is best to go into this one without it. I was tempted not to post it, but that seemed silly. "Most people seem itchy in their own body, like they can't wait to go home and unzip their skin." I felt sorry for Claire. I mean, she just had issues. Sister is a mess, family ships her off to New York. It's a bad scene. But then enter Grant, who is fabulous. Grant is a lovely character. More about him in the spoiler section, for those of you who've read this. I was definitely intrigued throughout the book, I wanted to know what was going to happen. I was pretty spot-on with my guesses, but I was still intrigued. There were some points in the book that I didn't feel were wholly necessary. A lot of the time in New York felt a bit like filler time. Yes, we knew Claire wasn't doing well, but I don't think we needed so much detail. And the emphasis on Claire's friendship with Rae in the beginning of the story either should have had more significance, or less focus. Obviously, the ending was.... unique. I can't say a thing about it without spoilers. Sorry. I will say this: On one hand, if my theory about what this story is actually about is correct, it is pretty genius, albeit not completely satisfying. Otherwise, it's just weird. There were a few errors (like discrepancies in ages, and words missing here and there), which is kind of annoying in a finished copy, but it didn't really bother me too much, especially once I cleared up that the age thing was just a mistake, and not something intrinsic to the story. Spoiler Section! If you haven't read the book and plan to, kindly divert your eyes. Thank you. Bottom Line: I don't know. I mean, if the point is what I think it was, then it does make some sense. But otherwise... I am just kind of confused. I will say this: Of Scars and Stardust is incredibly unique, and with characters that I really did care for. Which is probably why I am feeling so unfulfilled. 15-year-old Claire is devastated when her younger sister is attacked and she finds her bleeding in the snow the next morning. Claire is convinced that the wolves in the woods surrounding her town are the culprits, but nobody else will believe her. Are the wolves to blame? And what can Claire do to stop them attacking again? This was a really good mystery story, and I Finally a good book! This was a really good mystery story, and I liked how it kept me guessing right up until the very end! Claire was a character that I loved, but at the same time didn’t really trust. I felt heartbroken for her in the way she found her sister, and then felt her confusion and pain after the event. Her fear concerning the wolves was so real and so raw it was easy to see why she was so focused on saving people from them, and was so convinced that wolves were responsible for the attacks in her town. The storyline in this was good, and I liked the mystery and suspense. I seriously could not turn the pages fast enough to work out what was going on, and who or what was responsible! And those wolves certainly felt like they were breathing down my neck too! There was a touch of romance, but that wasn’t the main storyline, so understandably took a backseat to the rest of the story. The ending was good, although I would have liked slightly more explanation over exactly what happened, but there was enough for me to make an educated guess. This really was a great mystery/suspense story though, and I highly recommend it! *Reproduzco mi reseña de Of scars and stardust para el perfil en español del libro sólo por si alguien tiene la suerte de llegar hasta aquí. Heridas y polvo de estrellas (Of scars and stardust) de Andrea Hannah es un libro mucho más grande y profundo de lo que aparenta. Es de esos pocos títulos que me resultan inclasificables a la hora de sugerirlo porque podemos decir que se trata tanto de una historia de amor fraternal como un thriller de suspenso o una novela de horror. La misma autora da su *Reproduzco mi reseña de Of scars and stardust para el perfil en español del libro sólo por si alguien tiene la suerte de llegar hasta aquí. Heridas y polvo de estrellas (Of scars and stardust) de Andrea Hannah es un libro mucho más grande y profundo de lo que aparenta. Es de esos pocos títulos que me resultan inclasificables a la hora de sugerirlo porque podemos decir que se trata tanto de una historia de amor fraternal como un thriller de suspenso o una novela de horror. La misma autora da su definición de la obra pero no creo que ella pudiese ver los alcances de lo que había creado con la joven Claire Graham. Las tres horas posteriores al final de mi lectura se han ido en dar pasos atrás en la historia y encontrar los detalles importantes que no había notado. También levanté a mi madre a altas horas de la noche para hablarle de mi hipótesis acerca de lo que estaba sucediendo en esta historia. La construcción de la novela de Hannah revela una meticulosa revisión del texto para cercar al lector en sus propias conjeturas. Espacios en blanco, notas escritas con desesperación, revelaciones y pistas engañosas nos llevan a sentir la desesperación de Claire mientras trata resolver un rompecabezas arrancando piezas de sus borrosos recuerdos. El desenlace de la novela se barajó en mis posibilidades pero eso no le restó peso al descubrimiento. Incluso ahora sigo preguntándome qué cosas eran reales en esta historia, imagino que en algún momento me asomaré a la ventana y veré un pelaje gris cruzar el jardín, unos ojos amarillos aguardando en las sombras de la noche. Los lobos acechan en cada página, juegan contigo a las escondidas dejando pistas falsas, te llevan hasta el corazón de los sembradíos para acorralarte, cantan con aullidos la historia de la niña que durmió bajo la nieve. Espero que en cualquier momento ellos también aparezcan para mí, cuando nadie pueda verme o escucharme, todos esperamos por los lobos. Este libro lo termine desde el día de ayer, pero no me sentía capaz de ponerle una calificación inmediatamente por que me sentía sumamente confundida. Necesitaba que mi cabeza se enfriara un poco para poder decir que hacer. Decidí darle 5 estrellas por que la verdad es uno de los libros más extraños que he leído en mi vida. Para empezar la manera en que te atrapa la historia es impresionante. En ningún momento EN NINGUNO es aburrido. Se lee rapidísimo y todo en este libro importa. No tiene nada q Este libro lo termine desde el día de ayer, pero no me sentía capaz de ponerle una calificación inmediatamente por que me sentía sumamente confundida. Necesitaba que mi cabeza se enfriara un poco para poder decir que hacer. Decidí darle 5 estrellas por que la verdad es uno de los libros más extraños que he leído en mi vida. Para empezar la manera en que te atrapa la historia es impresionante. En ningún momento EN NINGUNO es aburrido. Se lee rapidísimo y todo en este libro importa. No tiene nada que este demás o que sobre. Los personajes son un poco confusos pero lo que si es que la historia va a hacer que se te derrita el cerebro, realmente nunca sabes que pasó y eso es algo que juega con tus sentimientos. No puedo decirles nada sobre el libro por que terminaría spoileandolo. Necesitan leerlo para que terminen igual de confundidos y enamorados de la historia como yo. Disclaimer: An e-galley copy of this book was sent to me by Flux in exchange for an honest review. I received no compensation for this review other than the book itself. What's Of Scars and Stardust all about? Seventeen-year-old Claire Graham left Amble, Ohio, two years ago, but the tragedy she tried to outrun still haunts her, even in New York City. Now, following the news that her sister Ella has sud Disclaimer: An e-galley copy of this book was sent to me by Flux in exchange for an honest review. I received no compensation for this review other than the book itself. Seventeen-year-old Claire Graham left Amble, Ohio, two years ago, but the tragedy she tried to outrun still haunts her, even in New York City. Now, following the news that her sister Ella has suddenly vanished, Claire returns to her hometown to find her sister and face what happened there. From reading my very vague synopsis of this book, you may think that this book is just your typical YA contemporary fiction. A main character who is running from her past, but the faster that runs, the faster that she runs right into her past. Typical, however, is FAR from what this book is. Claire Graham has a very close relationship with her younger sister, Ella. Ella is out spoken and knows exactly what she wants in life and will not allow anyone to tell her otherwise. Claire has an obsession with wolves, a myth that Rae, her best friend, told her, that she seems to have truly believed. On the night of Claire's birthday party, she has instructed Ella to stay home. Claire hopes to find Grant Buchanan, the brother of Rae, at her birthday party. Grant is not there and Claire becomes upset, but suddenly, Ella is there. Claire begs Ella to go home, even at the protest of Rae, who tells Ella that the wolves will get her should she leave. Reluctantly, Ella goes home, and the morning after, things in Amble, Ohio are never the same again. From the first few pages of this book, you can immediately feel the eerie tone that this book is going to take. You just have the overwhelming sense of unease. Claire is such an interesting character to read about. She has this unhealthy obsession with wolves, to the point that she even convinces her sister that the myths of the wolves are true. I even quite enjoyed the love interest, Grant. Grant is trying to deal with the fact that his sister can never just stay in one place for long periods of time and also the whispers of the town that he is a sympathizer to Claire. I think that Grant also really wanted to believe in Claire and her obsession with wolves. All of the characters are so unique and are struggling with their own demons. I really wish that I could have seen some more insight into Ella's character, however, I understand why some things were pursued while others weren't. Again, I don't want to give too much away from this book BUT I highly recommend it! I truly love books with unreliable narrators. I love thinking that something is real and then being shown otherwise. If you enjoyed We Were Liar by E. Lockhart then you will LOVE Of Scars and Stardust. I gave this book a 5 out of 5 stars and will be purchasing a hard copy when it comes out! I got a copy of this book through Netgalley. I was intrigued by the title and decided this would be an interesting read after scanning the synopsis. It was a quick read that started out amazing. It’s mostly a mystery of sorts with some ambiguous elements of paranormalcy and mental illness. Claire lives in a quiet town with her family. Her best friend Rae always teases her about the wolves in the cornfields, the wolves that are drawn to the color periwinkle and the taste of cherry. This all seems whimsical, if a bit creepy, until a little girl disappears one night. Claire loves her sister Elle, Elle is full of energy and whimsy and general enthusiasm for life, Claire has promised to protect her forever. Then after one night of tragedy all that changes. Claire ends up in New York living with her Aunt to recover from the “ordeal”. However when Claire gets news that Elle has disappeared she hurries back to her hometown to help track Elle down. Now Claire is trying to figure out if the wolves are real or if something else is haunting her hometown. This was a very quick read that was an interesting combination of mystery, paranormal overtones, and mental illness. There are many twists and turns throughout and the plot really keeps you engaged and guessing. The writing style uses a lot of description and made it easy to visual the scenery in the book. I enjoyed the way the writing flowed and how dreamy it was at times. There are parts of this book that are incredibly creepy too. Claire is a tragic character plagued by guilt over the tragedy that happened to her sister that night. I thought it was really bizarre that Claire and her sister go through all this and their parents’ idea of resolution is to send Claire to New York to live with her aunt, but that is explained as the story continues. While I really enjoyed the beginning of the book, the ending of the book is confusing and vague. You aren’t really sure what happens at the end or what is going on. I think this is done on purpose, but I personally would have liked more closure. You know what really pisses me off? When mental illnesses are an excuse for someone's behavior in a book. I can take it as an excuse in real life, but it really makes me mad, when in a book, the main character has all these hallucinations and such, but it's all because her brain's messed up. So this mental illness excuse is used for Claire Graham. Back in the day, her sister and her were really close, but after this sister, Ella, was found in the cornfields looking like she was attacked by anima You know what really pisses me off? When mental illnesses are an excuse for someone's behavior in a book. So this mental illness excuse is used for Claire Graham. Back in the day, her sister and her were really close, but after this sister, Ella, was found in the cornfields looking like she was attacked by animals, Claire is shipped off to some place. Ella is missing later, and Claire comes back. And Claire tries to solve this mystery. Then the excuse pops in at the climactic moment, then the story ends. I also can't stand Ella or Claire. These girls are both idiots-Ella for (view spoiler)[running away (hide spoiler)], and Claire for being naive and a total kid. She's seventeen and really should act like it. The whole mystery element involves going around in circles again and again, and it isn't even Claire that does the work-it's mostly Graham, some guy that she used to know back in the days. It doesn't help that Claire and Ella's background story is so generic. I do have to admit that the part of Ella trying to tag along to everything was well-written. I used to have that problem with my little sister as well. So Claire comes back to town, and the first thing she does is meet Graham and spill her whole life out to him. He might have been her former bff's bro, but really? It's been a couple years and things have changed. And suspiciously enough, Graham is the perfect gentleman and listens to her story. He even helps her, without a single bit of hesitation. Graham really is too nice. Then they solve the mystery. I really hate who turned out to be the killer/evil person. It doesn't make sense and this person was actually an okay character. Then that excuse! Really makes me want to strangle someone. I felt sorry for some of the characters in this at times, but I didn't connect with them enough to love them. This was an interesting read, although it could be very confusing! It made me feel utterly lost at points. It was an enjoyable read overall though. I think the most enjoyable part of OF SCARS AND STARDUST was that I knew absolutely nothing going into it. It had been sitting on my kindle for ages (whoops) and I started it on a whim. It quickly hooked me, but the story itself fell flat when I discovered what the resolution was going to be, the reason for the mystery is pretty much revealed in the synopsis, which takes all the fun out of the story in my opinion-I’m glad I didn’t read it before I read the book. (view spoiler)[I totally thought t I think the most enjoyable part of OF SCARS AND STARDUST was that I knew absolutely nothing going into it. It had been sitting on my kindle for ages (whoops) and I started it on a whim. It’s really hard to rate this book because on one hand, I really enjoyed the writing. There are some great quotes. Descriptions are vivid, and it’s easy to imagine the setting and what is going on. You’ll definitely never say ‘Wow, I wish the violent parts had been described better,” because they are quite detailed, as is the rest of the book. On the other hand, once I finished the book and discovered the real reason for the disappearances I was very disappointed, and that changed my opinion on the entire book. (view spoiler)[Mental illness, really? I did not like how that was treated at all. (hide spoiler)] Although it’s interesting to experience the story through the narrator’s eyes, I think the story could have gone a different way that would have been better. 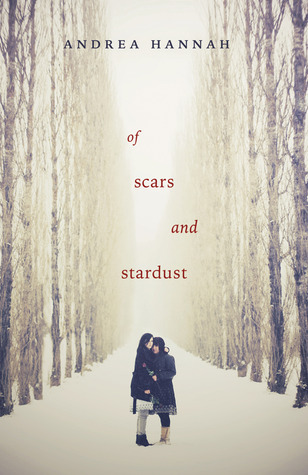 Thrilling and delightfully unpredictable, Of Scars and Stardust was a wonderful YA read. From the constant threat of danger, to the compelling mystery, the shocking secrets, and the sweet romance, this book was fantastic. I really liked this book. Claire was a lovely heroine. I liked how protective she was of her sister and how determined she was to keep Ella safe. Her character harbored some truly surprising secrets that made her very interesting. I thought she was great. Grant was a sweetie. I l Thrilling and delightfully unpredictable, Of Scars and Stardust was a wonderful YA read. From the constant threat of danger, to the compelling mystery, the shocking secrets, and the sweet romance, this book was fantastic. I really liked this book. Grant was a sweetie. I loved how he was determined to stand by Claire's side, even as the town branded her as a crazy murderess. He was very endearing and sweet and I totally adored him. The romance was very cute. It wasn't the main focus of the book, but it added some lightness to a rather dark book. I thought it was sweet. But, that ending has me questioning the entire relationship. The plot was slow to start. I was't fully engaged in the story for about the first half, because it took a while for the mystery to be established. But, then the plot picked up and I was hooked the rest of the way through. The thrills kept me on the edge of my seat, with the threat of danger and constant suspense. The secrets revealed in this book were shocking and I never saw any of them coming. The story was engaging and the ending took my totally by surprise. This book definitely doesn't fall into predictability! Of Scars and Stardust was a wonderful YA thriller. I really liked this book. With the thrills, secrets, and sweet romance, this book was thoroughly enjoyable. YA lovers, this is a book worth checking out. Oh my gosh. I have no words. Right up until the last chapter I was like- "Ok, I know what's happening. No I don't. Yes. No." I LOVE books that keep me guessing. The love between Claire and Ella is so clear and real, and that's about the only thing I'm sure of--that love was real. I'm uncertain about nearly everything else, and now I want to read it again to look for more clues. The way this story was told was perfect. Andrea is a master. I need to wipe my face, dry my tears, and pull myself together before reviewing. But I'm fairly certain this will be my best read of the year. Which is a ballsy thing to think in February. The two most important things I took with me when I left Amble: Ella’s periwinkle bird and a mountain of guilt. I took the same two things with me when I came back. Claire Graham is sent to New York after an attack on her sister Ella when walking home at night. Claire blames herself, as do the town Amble. Claire can’t escape the wolves. The wolves she believes attacked her sister and the wolves she believes are still watching her in New York city. He psychiatrist calls them ‘delusions’, but Claire believes that they are more than that. When her sister goes missing, she goes back to Amble to search for her. When there she is haunted by more than just memories. She has to deal with the wolves, the town and her family. I’ve not read many books this year which I can call a favourite, but this is one of them. Of Scars and Stardust caught my attention from the very first page, and did not let it go. I did not rate it 5 stars but don’t ask me why because I can’t answer it. For some reason I couldn’t actually make myself rate it 5 stars. Well, let’s get on with the review. I’ll start with the plot. Contemporary books are always an issue with me. I always find it hard to find a contemporary that isn’t just all the same recycled material over and over and that doesn’t have cliché romance. I am so glad I requested this on NetGalley because I did thoroughly enjoy it and I would highly recommend you pick this up if you are fan of mystery contemporaries. It will be pretty hard to write this review without spoiling anything. We spend most of the book wondering if the wolves that Claire sees are real or are in fact delusions. I liked that it kept you guessing and turning the pages. The mystery of the book was really good. I spent the whole book with a suspect in mind, but I kept second guessing myself, but it turned out I was right. There was a good twist about the attacks and it was something which I have not read before and it was very refreshing. There’s not really much more I can say without giving too much away so I will leave it there. The characters were really fantastic. I really do love unreliable narratives. You spend the whole book wondering if what Claire is seeing is real. Has she contributed to any of the attacks? This thing with Grant at the end, do we ever find out who did it or was it her? Was it really the wolves? My mind was just reeling over what was happening. Claire was a really great characters that really captured my heart. Ella was another great character, despite her not being there for the majority of a book. That really says something about a writer if they can make you love an absent character. Grant was another favourite. He was so kind and helpful and he really did believe in Claire. The romance was also very refreshing. Despite them falling for each other pretty fast (they did know each other quite well in the past), it still felt very real and I really did feel the chemistry between the two. Unfortunately I had a lot of "life happens" interruptions while trying to read this book and that resulted in me putting it down and picking it up for short snippets here and there over a month long period. 336 pages in a month?! That's ridiculously slow for me. My interest level never really grew enough for me to want to come back to the story. And because of that my overall rating dropped some. I couldn't seem to get deep enough involved with the story line or the characters. The character development also seemed lacking, especially where Grant and Claire are concerned. What the....what on earth?! I'm so incredibly confused by this book. I liked the uniqueness of the disappearance of Claire's sister and the other little girl in their town, the mystery that surrounds both of the girls disappearances. But I was left with a whole lot of confusion and unanswered questions at the end. It's not often I read a book where I feel like I need someone to explain to me what just occurred. This is one of them. Small town, Amble, Ohio has a lot of legends about wolves. These wolves are said to attack people and they crave cherry flavoring or cherry scents, oh and the color of periwinkle. Claire's thirteen year old sister is attacked one night and fifteen year old Claire is to blame for her injuries. To keep her out of jail her parents have her evaluated by a psychiatrist and sent to Manhattan to live with an aunt. While living with the aunt, 2 years later her sister goes missing and Claire finally goes back home to try to figure out what has happened to her. Along the way she and Grant connect once again (someone she was close with before leaving) and he helps her to piece together clues that Ella seemingly left behind. Claire believes the wolves have taken Ella, that they were the ones who attacked Ella in the cornfield and the other missing girl in town and she will get the proof she needs to prove it to everyone else. I thought this book was going in a completely different direction - one that I was totally on board with and anxiously waiting to see the conclusion. But woah - the way it went was crazy weird and I still don't understand what I just read. What about Rae? Patrick? Grant? Ella and Claire's parents? Ella for crying out loud? There were a TON of grammatical errors throughout the ebook version I received from Netgalley. Missing words, words inserted where they shouldn't have been, the wrong usage of words given the context of the sentence (example: using "her" when it should've been "him"). That many errors made it harder to read. Overall it just felt extremely strange. So yeah, my initial reaction stands. What the what?! Sorry guys, this one just wasn't for me. "Sometimes, the unknown is far scarier than what's really there, when you're ready to look." And maybe that's just what we were now: two people with broken sisters that needed to stitch each other back together with hand squeezes and stillness. And maybe that's okay. Maybe that's more than okay. "It's just that, you're one of those people that can do anything, if you want to," he breathed. "You're kinda like magic, Claire." I wondered which was more lethal: What was inside the cornfield, or out. And did it even matter anymore? After reading the blurb for this story this book promises a really mysterious and rather dark story with a main character that has a lot to deal with and I'm happy to say that it delivers. Not only that, but I found books that are somewhere in between reality and paranormal really interesting and they always turn into a great reads. Of Scars and Stardust did too. It all starts in winter, one winter many years ago when Claire witnessed a really shocking moment Review also posted at Ja čitam, a ti? It all starts in winter, one winter many years ago when Claire witnessed a really shocking moment in her life for which she blames herself. Now, many years and bad decisions later that moment is still hunting her and after her sister mysteriously vanishes it hunts her even more. It's time for her to go back and solve the mystery that's been occupying her thoughts for a very long. Upon coming back she will have to face her past and not only moments and memories, but also people. It's also a small town, that doesn't forget things that fast, and not everyone is willing to help. Maybe my favorite part of this story was that it was divided into past and present. It was so good to see what happened that caused Clarie trauma and what was a cause of many sleepless nights in her life. She was a really believable character, with real fears and troubles. It was really easy to go through this story with her and hope that everything will end up without fatal consequences. Of Scars and Stardust really gets 3.5 stars. It was a departure from my usual reads, but I quite enjoyed it. I will admit that I was a little lost and confused for a good portion of the book, which probably cost it a little in terms of rating. I understand that it was on purpose, but a little bit of clarity could be a good thing. There was a bit of choppiness present with Claire. Again in reflection, this may have been somewhat on purpose, but it does detract from the writing a little. I think this one is probably worth of a reread. Now that I know how it all comes together, I think there is more to be gleaned. And I think I may enjoy it even more on the second pass. The ending was actually very well written, but I could have done with a little more. This was a case where there was a lot of potential that wasn't used. It just worked out okay for this one. This review has been hidden because it contains spoilers. To view it, click here. Realmente me gustó la manera en que la autora juega con tu mente. Desde el principio me atrapó, es un libro fácil de leer en cuanto al vocabulario pero que requiere de toda tu atención y concentración para que no pierdas ningún detalle. Es un libro que te pone a pensar, te pone nervioso y te envuelve. El final me gustó porque era algo que realmente no esperaba. Como dije, no me esperaba el final. Ni siquiera sé si lo comprendí bien. No esperaba que Claire fuera la atacante de l Realmente me gustó la manera en que la autora juega con tu mente. Desde el principio me atrapó, es un libro fácil de leer en cuanto al vocabulario pero que requiere de toda tu atención y concentración para que no pierdas ningún detalle. Es un libro que te pone a pensar, te pone nervioso y te envuelve. Como dije, no me esperaba el final. Ni siquiera sé si lo comprendí bien. No esperaba que Claire fuera la atacante de las dos personas que más quería. Lo de Ella no lo dudé tanto porque el ataque sucedió mientras Claire estaba alcoholizada y ya no estaba en la fiesta. Pero no comprendo el ataque de Grant, se supone que ella estaba con Patrick mientras sucedió el ataque. Heridas y polvo de estrellas fue libro que me gustó. Tiene ese aire de misterio de Gone Girl, mezclado con teen fiction. También me recordó un poco a la película de "Uninvited" por la cuestión de las hermanas. En mi opinión, creo que es un libro que si pones atención lo suficiente puedes "adivinar" el final. Sin embargo, te mantiene a la expectativa debido a que hay varios plot-twists. Se lo recomiendo a todas aquellas personas que les gustan los libros de misterio y libros con temática YA. Aunq Heridas y polvo de estrellas fue libro que me gustó. Tiene ese aire de misterio de Gone Girl, mezclado con teen fiction. También me recordó un poco a la película de "Uninvited" por la cuestión de las hermanas. It was extremely frustrating reading this book because I had no idea what was happening. I'm not the type of reader who likes surprises or speculating about things, so there were times I wanted to tear my eyes out. I found Claire to be a very unreliable narrator but the writing was nice enough. Overall, book was fairly decent, had some nice twists and turns and left me mindblown at the end. Would recommend to fans of paranormal or psychological stuff. Disappointing. Unsatisfying. None of the promise the book showed actually amounted to much. I'm hovering between giving it an extra star just for the excellent title and concept, so sure. Two stars. Do not recommend. But let me just say, WOW! This is a fantastic read! Debut author Andee has really set the bar high for everyone else. This will be a tough book to beat in 2014! Love love love. Review shall be posted closer to the review dateI would like to thank Flux and NetGalley for granting me a copy of this e-ARC to read in exchange for an honest review. Though I received this e-book for free that in no way impacts my review. This book has more twists and turns than a switchback-covered, hairpin-filled road winding through the Italian Alps. The core group of characters are Claire and her younger sister Ella, as well as Rae and her younger brother Grant. All are in their early- to mid-teens at the start of the story. A story that ultimately revolves around local legends, legends Rae took great pleasure in telling to Claire and Ella. Only Rae's versions were filled with outrageous embellishments. Right there is a huge clue that something's not right in the town of Amble. Wolves with a thing for cherry-flavored items, human flesh, and the color periwinkle - who would believe such tall tales? It seems Claire, and by extension, her younger sister Ella got caught up in the stories. It didn't help that Rae reveled in telling them to the sisters just to watch them squirm. But she unknowingly set something in motion; she had no idea just how deep her tales had sunk their claws into the sisters, or what the ultimate outcome of her teasing would cause. On her way home from a secret party for Claire's fifteenth birthday Ella is attacked by the wolves. Claire found her in the cornfield and lost it. Due to her unrelenting hysteria, and to give Ella some peace and quiet in which to heal, Claire is sent to NYC to live with her aunt. Two years go by with no visits home. But Claire no longer notices how long it's been because she's too busy worrying about the wolves that have somehow followed her to the City. Then the phone call comes, changing everything. Ella has disappeared. Claire knows the time has come for her to go back home to find the truth. And if she's going to rescue her sister she has to work fast. Claire is an incredible earnest character, one who is believable even when she's spouting the unbelievable. She wholeheartedly believes it is up to her to rescue Ella, a task she sets to with a will. Along her journey she learns many things, for she is adamant about learning the truth once and for all. The town and home she returns to has both changed dramatically and not at all. Grant, Rae's younger brother and the boy Claire has had a crush on since she can remember, is now a deputy in training for the Amble police department. But he still cares about Claire, and he's willing to do what he can to help her out. It turns out that he too has a vested interested in discovering the truth. Amble keeps her secrets close, and woe to anyone that crosses the will of the town of Amble. These people never forget and never forgive. A lesson Claire is learning the hard way. But what she learns is not just about herself. During her investigation she discovers many hidden truths: truths about herself, Rae, Grant, Ella, even about her parents. The complex characterizations make this an exceptionally fascinating read. It is well enough written that as the reader it is difficult to separate fact from fiction. Since the reader usually has much more information than the characters, what Ms. Hannah pulled off is a complicated and challenging literary feat. Even if you begin to suspect a certain truth, each time you think you know for sure something comes along to put you off-balance again. So you keep going forward in your deductions, only to be pushed right back to where you started. All courtesy of a fine steel-like thread of confusion interwoven throughout the entire book. Al principio es algo confusa, y cuesta meterte en la historia, pero cuando finalmente te atrapa es bastante genial pues siempre te mantiene con el suspense y te obliga a preguntarte "¿qué es real?". Me quedo una sensación agridulce debido al final. No es que sea un mal final, de hecho es algo que uno se espera debido a como la trama va girando, pero aun así sentí que le falto algo para que fuera mejor. La historia empieza con Claire tratando de lograr un objetivo y todo va bien, hasta que el libro ya no se centra para nada en la manera en la primera premisa, por lo que a mi parecer eso dejo varios huecos en la historia. Es muy al estilo de "Eramos mentirosos" pero con un poco menos de suspen Me quedo una sensación agridulce debido al final. No es que sea un mal final, de hecho es algo que uno se espera debido a como la trama va girando, pero aun así sentí que le falto algo para que fuera mejor. Es muy al estilo de "Eramos mentirosos" pero con un poco menos de suspenso en mi opinión. Buen libro si quieres algo nuevo y diferente para leer. Some editing issues aside, I enjoyed it!